If you recall, last time I highlighted how invaluable retinol was as my weapon of choice with my ongoing war against ageing. Well, if retinol is my nuclear bomb, then glycolic acid are my missiles. However, as with retinol if your skin is somewhat sensitive then you have to be ultra careful with the products you use and how you use it and the frequency of use. And just like retinol there are myriad products that contain it. First I am not talking about having glycolic chemical peels, that’s something else that I will discuss at a later date. I am outlining my favourite products that contain this substance and the mixes and procedures that I have discovered that yield astonishing results and the do’s and many don’ts of their usage. Now because our skin types are subject to change because of the many variables , such as the climate, that it’s exposed to, I like to vary my cleasner accordingly. If my skin is somewhat dry and a little inflamed then obviously it needs a soft moisturising kind of cleasner, but I do sporadically love to use a facial wash that contains glycolic acid. My favourite is a product called Anthony from Spacenk. I often use this for a few days, but my skin can become very dry from over use of face washes, so I am pretty conservative with its use. But what it does do is it gives my skin a gentle exfoliation and tightening of the face, which is also facilitated by using a muslin cloth to remove the product. 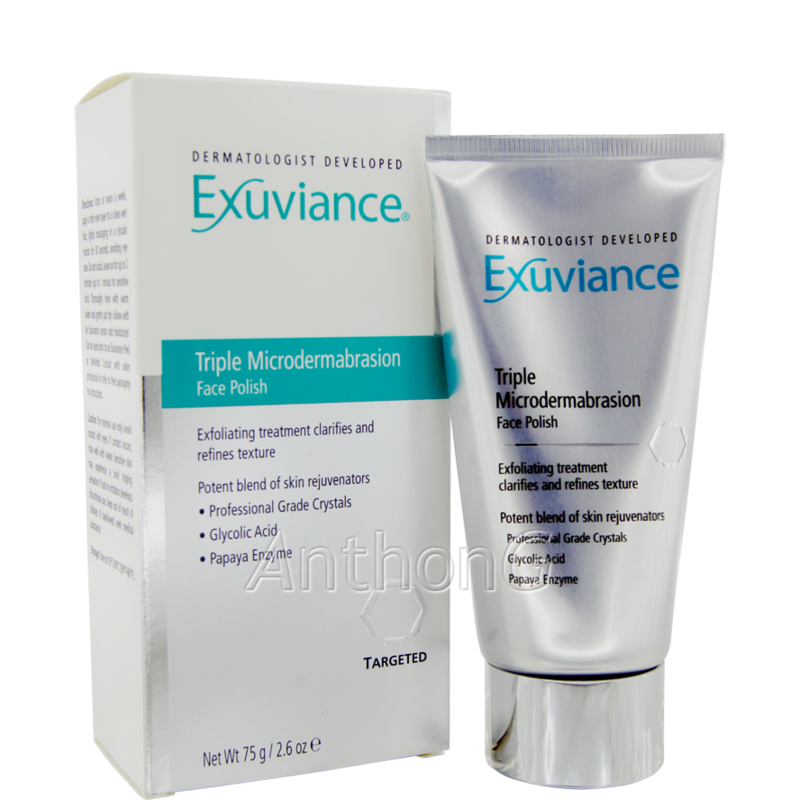 What exfoliating does is remove the dull lifeless skin cells from the face and speed up skin renewal and absorption of moisture. But it’s imperative not to over exfoliate the skin otherwise the skin will thin and be overly exposed. So, I use the muslin cloth twice daily, because it’s very gentle, but varying my choice of cleasners depending on my needs. Now ever so often it’s effective to do microdermabrasion. This will buff off more stubborn dead cells and stimulate the cell renewal, but again this must be done very infrequently otherwise it will thin and age your skin. I used to go to a beautician for this costly treatment, but recently I was introduced to a wonderful product with professional grade ingredients. 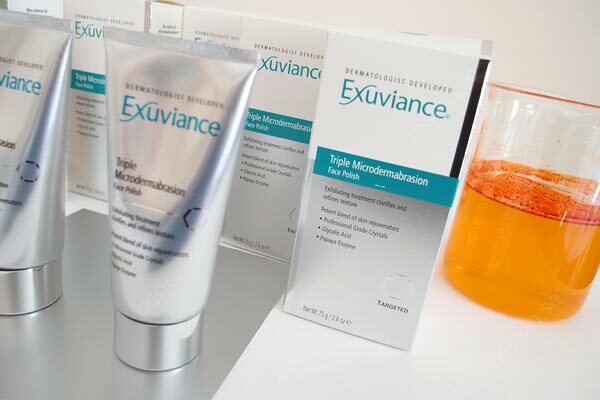 Excuviance created the Triple Microdermabrasion Face Polish containsing papaya enzyme and most crucially glycolic acid. Now I thought it would be too extreme to use it after cleasning with my Anthony cleasner, but it wasn’t. My skin loved it, and the following morning I would wake up with incredibly smooth and youthful skin. 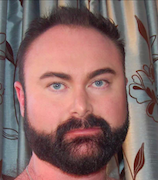 But what really was enhanced my battle of ageing was when I mixed a small amount with the Anthony cleasner, and gently massaged my face even around the delicate eye area. But only do this is your skin is not too sensitive and can tolerate glycolic acid, and initially, not to be used in conjuction with retinol, this can be too harsh for many skin types. Thankfully your skin can build tolerance and you can safely cleanse and exfoliate with glycolic acid then use a retinol serum immediately. This should help to stimulate collagen production, which keeps skin elastic. I like to do once or twice a week, but never more, and it really gives me a more youthful appearance. Have fun with your products, mix and match them, but make sure your skin can tolerate the ones which are more extreme, and remember when using glycolic acid and especially retinol always wear a strong SBF.